Can you really make money with a 20% win rate? For the past 16 years I've followed a strategy that's yielded a 60% win/rate on average. This means every 10 trades I take, I can expect to bank 6 winners. This year, it's been different. In fact, it's been one of the most difficult years to profit from the JSE as the market has remained inside a tight sideways range. Last week, it got to the point where I started to worry about my own trading strategy and results. Not only will I show you why I am no longer worried about trading in these conditions, but I'll also show you how you can make money with a 20% win rate. I’m talking about the Minimum Win rate formula. The Minimum Win rate formula will tell you the minimum win/rate you’ll need to keep your portfolio afloat in a difficult trading environment. You’ll only need ONE metric to calculate this. The Risk to Reward ratio. This ratio will tell you how much money you’ll risk compared to the amount you’ll expect to gain in any one trade. A Risk to Reward of 1:1 means, for each trade you take, you’re willing to lose R1 (Risk) for every R1 you’re hoping to make (Reward). Once you apply this powerful formula to your trading strategy, you’ll know exactly what your minimum win rate will be to stay afloat. So with a R:R of 1, what is the minimum win/rate you’ll need to breakeven? To find this out, you’ll plug it in the Minimum Win rate Formula. This means, excluding trading costs, you’ll need to maintain at least a 50% win rate if you’d like to continue with a low risk to reward of 1. To explain this better, let’s say you have a portfolio of R10,000. You want to follow the Risk to Reward of one. And you only want to risk 2% of your portfolio per trade. After one month of trading the markets you’ve taken 10 trades with 5 winners and 5 losers. 5 winners X 2% = 10% gain on your portfolio. 5 losers X2% = 10% loss on your portfolio. This means, with a Risk to reward of 1 and a 50% win rate, your portfolio will be at break even. This has just set the foundation of how important this formula is. First, here are some details. 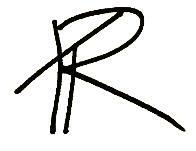 I trade a system with a R:R of 1:2 (Risk R1 to make R2) with an average win rate of 60%. But this year my win/rate has dropped to around 45%. I wanted to know whether to stop trading the system until the market goes back into a trending environment where I can profit again or continue to trade. But here’s the thing, even with a 45% win rate, my trading model remains profitable. Well, let’s look at the expectancy curve of the Minimum Win rate ratio. Even with a 45% win/rate, my current trading strategy will still keep me in the profit zone. In fact, it will only breakeven for the year if the win/rate drops to as low as 33%. For this reason, I am happy to continue to trade. 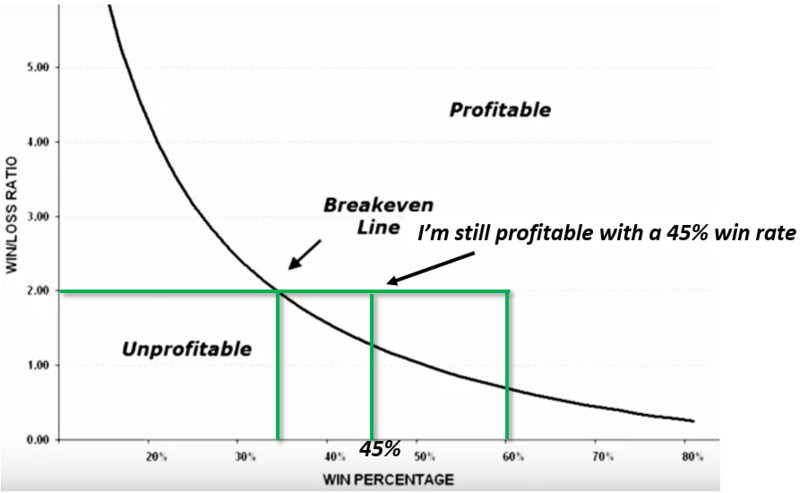 Here’s how you can be profitable with a 20% win rate. Take any trading strategy and make one small adjustment. With every trade you take make sure the risk to reward of 1:5. This means, if you buy a trade at an entry price at R100, put your stop loss at R90 this means you’ll place your take profit at R150 (Five times higher than where you place your stop loss). Just by doing this, you’ll profit with just a 20% win rate. Here’s the proof with the same formula. This means, your break-even mark is at a 16% win rate. 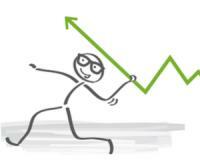 Even if your trading strategy had a 20% win rate, you’ll still be in a profitable region. Ok – you finding this a bit confusing? This means even if you have a 20% win rate at the moment, you’ll still end up profitable in the medium to long term. 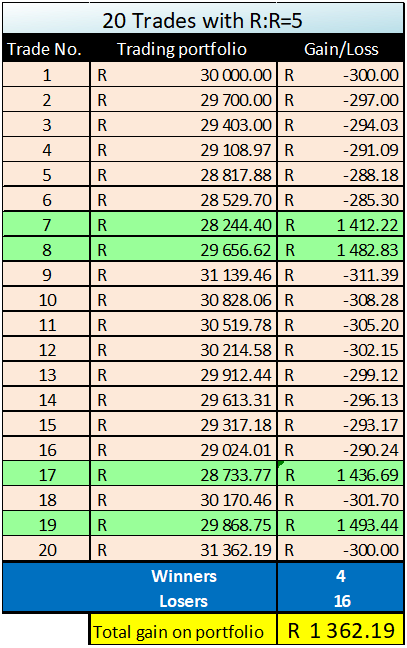 Now I know R1,362 doesn’t sound like much but remember, the JSE has been in a sideways trend. While many traders are blowing their accounts, you can at least come out in the green without a scratch. And when the market rectifies and chooses a direction, I guarantee your win/rates will rocket up. PS: I’m expecting the JSE to break out of its sideways trend any day now. When this happens we’ll have plenty of profit opportunities lined up. Don’t miss out on this opportunity.